The stunning designs and the vibrant reds, blues and oranges in these rugs will create a perfect centrepiece for any contemporary room. Adding a splash of colour by incorporating statement pieces in the same shade as your rug, such as ornaments, vases and artwork will bring the modern style together and create a beautifully balanced room. 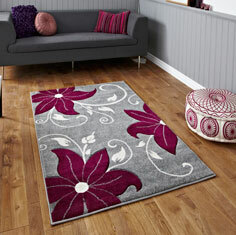 The rugs in the Verona collection are made from extremely hard wearing fabrics woven into beautiful designs with fashionable colours which makes these cheap rugs excellent value for money and a long-lasting addition to your interior. This new Wilton range is extremely hard wearing and represents excellent value for money. Hand-carved to enhance the overall texture.